Eating garlic has been linked to loads of health benefits including combating colds, reducing blood pressure and even improving bone strength. For me, I just love to eat it because it’s delicious. 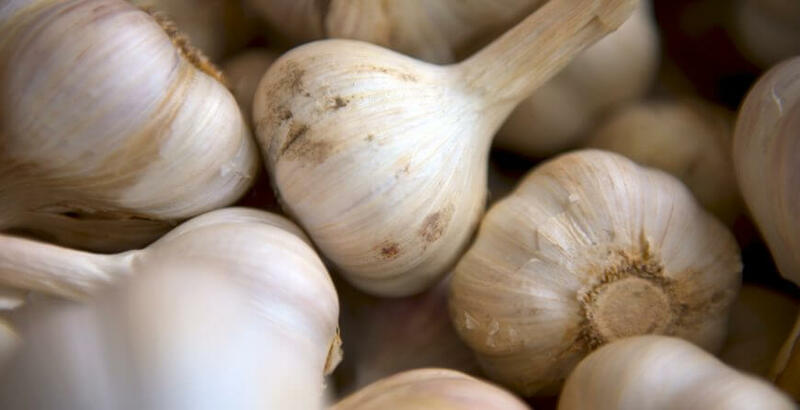 Here’s a fun fact for you: over 80 percent of the garlic sold worldwide comes from China. You know the perfectly formed, perfectly white, non-sprouting heads of garlic in the supermarket? That’s Chinese garlic. It is treated with growth inhibitors to prevent sprouting (thus improving shelf life), bleach to whiten it, along with other dangerous chemical compounds we need to keep away from our food. But here’s the best bit: garlic is unbelievably easy (and cheap) to grow at home. And it is delicious – so sweet and fresh. I promise you, once you grow your first batch of garlic in your straw bale garden, you’ll never buy it again. I find older, softer bales are best for garlic, as the softer straw allows the bulbs to form more easily than the tight, compacted straw in a new bale. The basic rule of thumb for growing garlic is to plant on the shortest day and harvest on the longest day of the year. I like to get my garlic planted around April/May here in Melbourne. Start with some good quality Australian garlic (I use organic). Plant cloves with the pointy tip upright, about 2cm down into your bale, spacing the cloves around 10cm apart. Each clove will grow into a head of garlic. When the green shoots die down (in around 5-6 months), your garlic is ready to harvest. According to Gardenate, garlic likes to be grown in the same space as beets, carrots, cucumbers, dill, tomatoes and parsnips but avoid planting with asparagus, beans, brassicas, peas and potatoes.